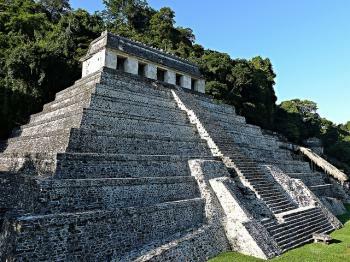 The Pre-Hispanic City and National Park of Palenque is a fine example of a Mayan sanctuary of the classical period. The city was at its height between 500 and 700 A.D. The buildings are decorated with reliefs showing Mayan mythology. 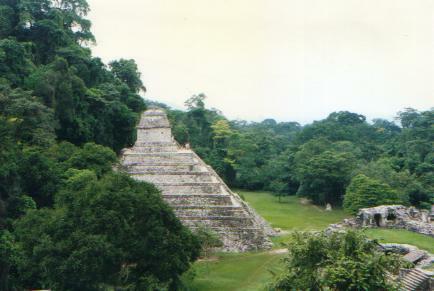 The Palenque temple-complex now is situated in jungle-like surroundings. The numerous (partly restored) remains of the Maya-architecture are quite well-preserved. Only 34 of the estimated 500 constructions in the area have been revealed. Together they give an impression what the city would have looked like during its heydays (although at that time the stones were colored red instead of gray). One of the most impressive sights is the grave of the Maya-king Pakal. It is situated in the Temple of Inscriptions, and can only be reached via a long stone staircase. The grave was only re-discovered in 1952. 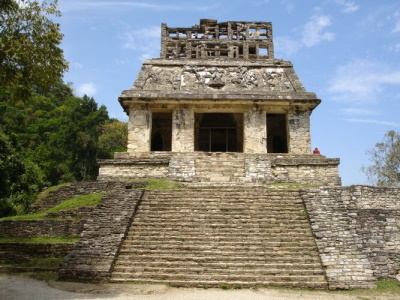 Palenque has much in common with Tikal (Guatemala), but for unknown reasons it is a lot less famous. The park impressed me a lot, both the temples and natural surroundings. 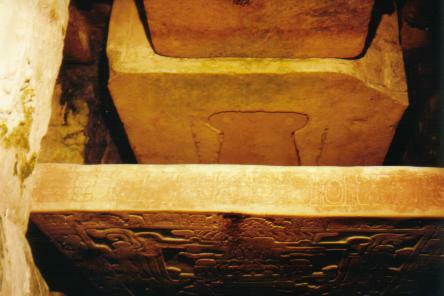 The grave of Pakal looks a lot like an Egyptian sarcophagi. The decorations (as a deathmask) and the skeleton however have been transferred to a museum in Mexico-City. 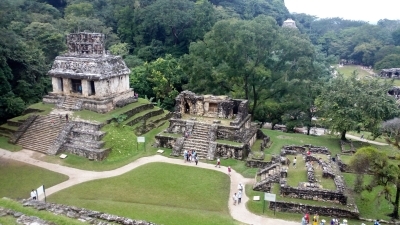 The ancient Maya city of Palenque amazed me in its diversity. After walking in the main upper entrance, you first come across a row of pyramids. The last of these is the famous Temple of the Inscriptions, which holds King Pakal's elaborate tomb. I was disappointed that you can no longer enter this famous pyramid and the burial chamber inside. But you can enter the adjacent Pyramid/Tomb of the Red Queen for a look around. Next, I proceeded to the huge Palace complex at the center of the site. This elaborate structure has a lot of interesting details such as the astronomical observatory tower. It has several parts to explore, as well as providing nice views over many other buildings of the city. After exploring it, I walked down to the Temple of the Count and the North Group, a set of lesser buildings that are near the site's ball court. I then made my way towards one edge of the site, visiting Group B and the Group of the Murcielagos (bats), which are some lesser buildings, but still sort of fun to wander through the small labyrinth of their remaining walls. By coming to this part of the site, you get to see the pretty cascades that form the Queen's Baths, a set of small pools along the ruins. Heading back up the stairs, I found the path to Group C was blocked off temporarily, so I went back through the Ball Court and past the back side of the Palace. I initially went past the Cross Group uphill to see the other temples back there that have some famous carvings, such as the Tablet of the Warriors. I came back down to the great temples of the Cross Group, including the Temple of the Foliated Cross, the tall Temple of the Cross (which provides nice views back toward the main plaza) and the third side of the Cross plaza with the short but long Temple of the Sun and ruins of another smaller temple. I visited without a guide. I had a map showing me where I wanted to go and the various buildings all have good signage in English and Spanish. After I was done with the ruins, I headed to the site's museum. Don't skip the museum! Some people even say go there first. I pretty much had the museum to myself. It has a fantastic replica of Pakal's ornate sarcophagus, with tons of signs explaining the significance of the figures adorning it. I spent quite a while there reading about it all. There are other great things in the museum, also, such as a collection of incredibly detailed incense burners looking like masks stacked upon each other. All-in-all, a really great site, although the nearby modern city is pretty chaotic. I was really surprised by how many people come here since it is pretty out-of-the-way -- mostly non-US tourists. I was in Palenque for only 3 nights, and was touring things at full speed nearly all that time. If you come, make sure to take at least a long day-trip to see the other Maya sites of Yaxchilan and Bonampak, which are very different and more remote than Palenque, and each very interesting in its own unique way. Coming in from Yucatan where I had already seen plenty of Maya ruins, I was wondering what more Palenque would have to offer. Some more pyramids I figured. I had heard or read little on the site and had a hard time fathoming what would be unique about it. 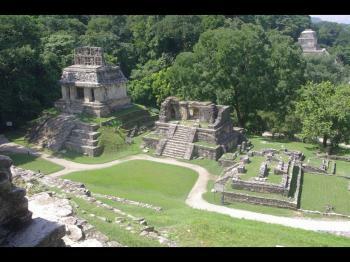 But Palenque is strikingly different from the Yucatan ruins. It's probably the setting with the ruins embedded in jungle and hills. I felt really reminded of Indiana Jones. Palenque is relatively hard to get to. The next major town is Villahermosa (2,5h by bus), a town not generally on the average tourist's itinerary. The main tourist stops nearby would be San Cristobal de Las Casas and Campeche. Albeit "nearby" is not really appropriate for 5h resp. 8h trips. Luckily, the site is well worth the effort (5* rating from me). In my case I came from Calakmul. After lunch I got on a bus in Xpujil to Escarcega and from there on another bus to Emiliano Zapato. In Emiliano Zapato I jumped on a Colectivo to Palenque arriving at night. I think it took me 10h or so to make the trip, but it all worked out and the plan had plenty of buffer. Still, working with the limited online information available I was a bit worried if I would make it. After having visited the site I left in the afternoon for Villahermosa from where I continued to Tlacotalpan (bus to Cosamaloapan, local bus from there) the next day. 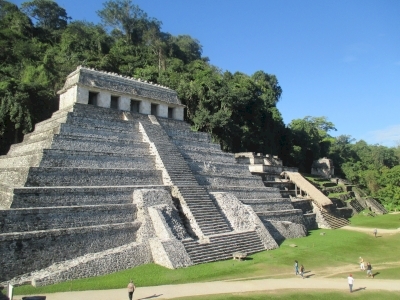 Palenque offers a unique and striking testimony of the Maya civilization. The site is set in the forest and wildlife is omnipresent throughout the visit. The numerous pyramids and temples along with the main palace are in remarkable state of conservation. Within the monuments, many sculptures have remained, demonstrating a full aspect of Maya art. On top of that, it is possible to enter one of the pyramids to see the tomb of king Pakal. I visited this WHS in December 2015. I would definitely place Palenque as one of the best examples of Mayan cities in Mexico and I'd recommend spending a night there to be able to visit at sunrise. The pyramid like structures are similar to Tikal in a way although I think Calakmul is more comparable to Tikal on the whole. No climbing is allowed on the main structures of Palenque but I think it's a plus side as the best way to appreciate these structures is mainly from the opposite minor structures. During my visit the majority of tourists were Mexican as the coaches and tours for foreigners arrive towards 11am from Guatemala or in the afternoon from Oaxaca. If your priority is photography head straight to the top entrance as early as possible and not later than 07:30 to beat the never-ending vendors, mostly children. The main plaza, like Chichen Itza, is only a few steps away so it's worthwhile heading straight beneath the astronomical tower for the best views. The top entrance reminded me of the negative aspect of Angkor Wat ... children trying to sell the same postcards or cheap souvenirs, official and fake tour guides, etc. Parking spaces were non-existent already at 07:30 and don't fall for the car-wash or 'watching service' scam offered to park your car or to look after your car. Just park for free 50-100 metres downhill on the side of the road if only to have easier access to exit. Otherwise the best option is to park your car at the great museum housing several masks, inscriptions, artifacts and a very good reproduction of Pakal's sarcophagus (entrance is included) and use the lower entrance just opposite. This entrance will entail a number of stairs in the shade to a small waterfall and then up again towards the main plaza and could be a good alternative too to avoid any hassle. However, the Unesco plaque is just after the top entrance so it's worth keeping in mind. Apart from the main plaza, the highlight of my visit were the several embossed inscriptions and masks which are pretty unique and in a very good condition. The best inscriptions are to be found on the northwest side just beneath the astronomical tower away from the main plaza on a bright white stone. On the stairs going down just behind the astronomical tower there is a magnificent sculpted mask which could easily be missed. Just look out for the dried palm leaves or the perspex 'roof' protecting it from the rain and you'll spot it. Another unique feature is the rabbit skull relief just above the stairs of the Temple of the Skull. Palenque is a really great site although it does not offer a jungle/forest setting anymore (several green lawns instead like Tikal's main plaza). Howler monkeys are getting closer to the city (or the other way round actally!) and there are billboards everywhere. Electricity pylons are protected with nets to avoid howler monkeys getting electrocuted when crossing from one side to the other of the streets. The best time to spot birdlife is mainly at sunset but sunrise could also be a valid alternative. I spotted several scarlet macaws, parakeets, motmots, egrets, herons, orioles, etc in the wild (it's sad that there is a Palenque Ecopark/Zoo when most caged animals/birds can be easily enjoyed in the wild). It's surprising that not many have visited/reviewed this great WHS but perhaps its unconvenient location can also be seen as a positive aspect it can still be enjoyed without the crowds.